I’m traversing South Florida in search of the best plant-based restaurants. You can share your comments at the bottom of the page or join our discussion on Facebook. If you’re not already a subscriber of my blog, you can sign up on the homepage to receive future reviews via email. Next stop: Veg Eats, a 100% vegan spot in Delray Beach, Florida. I recommend making the quote smaller and abbreviating it if they decide to use it. I would also feature more images of their food on the homepage. They have two descriptions of food without photos on their menu page. Not a good look. If these are new items they haven’t prepared yet, they should add a stock photo of their restaurant or wait to post them. First impressions matter and these missteps send a message to potential customers that they may not have their plant-based ducks in a row. If I wasn’t reviewing this restaurant, I may have skipped it based on the website. Do they have the same lack of attention to detail in the kitchen when it comes to cleanliness? I’m concerned. The “Blog” on the website only has one post and it’s from a year ago. I would eliminate it or activate the blog. People like to see an active website. The “Restaurant Philosophy” section is blank. I would remove it from the website and add it back when it’s finished. The “Lists” section is blank although I don’t know what “lists” means. I recommend a list of improvements to the website. It’s likely leftover from a web template. The “From the Press” section is also blank. They should solicit press coverage or temporarily remove it. Geez. The logo on the Veg Eats Facebook page doesn’t appear on their website, which reveals inconsistent branding. They have appetizing photos on their Facebook page but the website shows icons for Twitter, Instagram, and Foursquare but they don’t have accounts linked. They should remove them from the website and feature the link to the Facebook page only or update the links. Zoinks. The font on the “Hours” page is too large and looks unprofessional. The website still has a message on it that they’re closed for Christmas. It shows a lack of attention to detail. They’re open odd hours, closing at 6:00 p.m. They may have children at home or want to spend evenings with their family. They’re only open for lunch on Saturday and offer brunch on Sunday. As a general rule, I recommend against using “my” whenever possible. Business owners are best-served presenting themselves as a team (“we”). I sent a follow-up email asking if the image of sandwiches on the website appeared on the menu. I never received a reply so I’m going to assume it’s a stock photo. Customers may find it misleading since restaurants usually only post photos of their own food. I subscribed to the restaurant newsletter but I didn’t receive anything. I should have at least received an automated reply with a welcome. This is an easy step to automate on the back end of a website. The “Menu” page is nicely laid out. It contains appetizing photos although they should enlarge when clicked on. It doesn’t appear they include their entire menu on the website. Unfortunately, when I revisited the website to collect information about ingredients, the menu page didn’t work and instead showed the following message: “502 Bad Gateway: nginx.” That’s bad news. This team needs to get their website fixed lickety-split. It’s costing them money. The “Our Vision” section contains a welcoming message but calls the restaurant “Veg Out Foods” and it’s called “Veg Eats” and “Veg Eats Foods” through a Google search. It would serve them well to finalize their name and stick with it for branding purposes. It’s my guess they went through a few iterations before settling and previous names have been left floating online. Since web design and development obviously isn’t Jade’s forte, I hope she’ll hire someone and share this feedback. It’s an easy fix and worth the investment. I decided to visit for brunch on Sunday so I could try the Just Egg dishes. I tried to open the door at 10:55 a.m. but it was locked. They don’t open until 11:00 a.m. on Sunday. Jade saw me and immediately unlocked it. I’ve stood outside many businesses prior to their opening and been required to wait until the exact minute for employees to open the door. That’s a bad practice. Even though she wasn’t ready to open, Jade’s willingness to let me in early demonstrated an understanding of the value of greeting a customer and the silliness of making customers wait for the clock to strike a rigid open time. Message to all business owners: When people are waiting at your door to give you money, let them in. Follow Jade’s example. When I entered, Jade seemed preoccupied preparing to open. I sat a few minutes after they were officially open and then her assistant brought a single stand-up menu encased in plastic. I had to share a menu with another diner, which was inconvenient. Every customer should receive their own menu. Unfortunately, Jade didn’t welcome me, ask me if I’d been there before, or provide background information on the restaurant when I entered. I was the only customer as they had just opened so there was time. That was a missed opportunity to make a special first impression. Since I was sitting a few feet from her, she could have simultaneously prepared to open and engaged. Customers first. The floors, tables, and kitchen were clean but I arrived when they opened so I’d expect no less. The walls are white and lacking photos on one side. They could warm up the dining area by painting the walls a color. 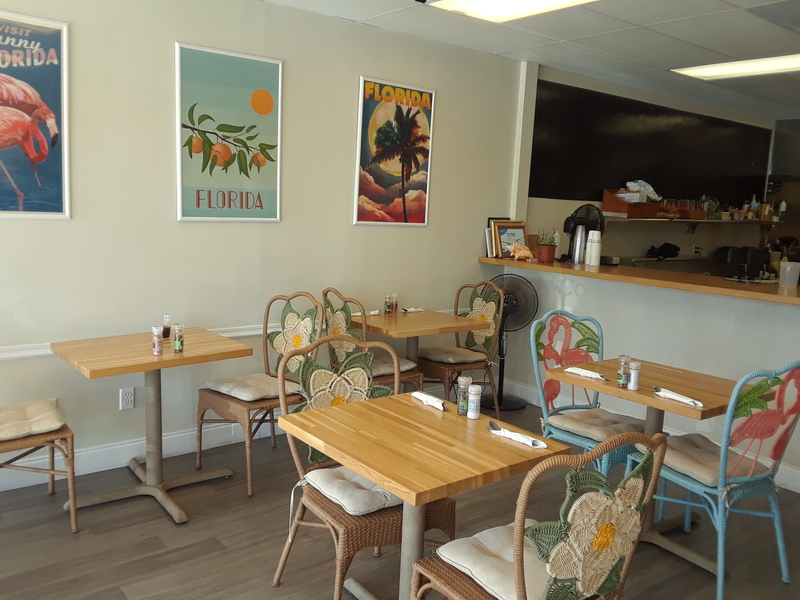 The tables and floors are modern but they’ve added wicker flamingo seats which, while comfortable, don’t seem to match the decor but I’m not an interior designer. Veg Eats is located in an upscale shopping plaza near the beach. The location looks better than where most vegan startups wind up (understandably to reduce overhead) and should generate traffic. They have two fridges where they sell drinks and to-go meals, which appear to be popular. I observed Jade and her assistant eating behind the counter while I was eating. As a general rule, employees should avoid eating in front of customers. I was glad to see Jade wearing gloves as she was cooking though. They were also simultaneously posting photos of the food to their Instagram, which is a good use of time to promote a small restaurant. The food was served in 11 minutes although I ordered water with my meal that never arrived. Some wait staff like to take orders without an old-fashioned pen and pad–a practice I’d avoid to ensure accuracy. The waitress checked on me a few minutes into my meal to ensure I liked it. Bravo. I ordered the Just Egg Sausage and Cheese Sandwich ($12) and the Just Egg Veggie Scramble with Fruit ($12) to taste the Just Egg. My friend Josh has come a long way since we first talked about “Beyond Eggs” on my radio show five years ago. Jade’s Just Egg options are the reason I chose to visit for the Sunday brunch. The food arrived on a flimsy paper plate, which although likely compostable, isn’t eye-pleasing. The egg muffin was dry and relatively tasteless. It was essentially a square block of Just Egg with sausage and melted cheese on an English muffin. Skip it. 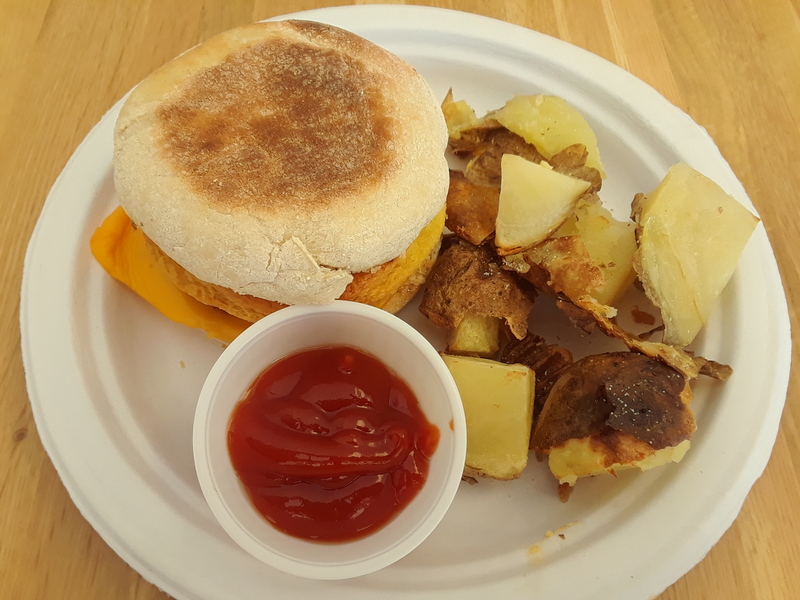 The egg muffin came with a side of potato wedges (unfortunately). They were undercooked and naked although she advertises them to contain rosemary. This lackluster presentation suffered from an absence of creativity. I later learned Jane doesn’t use oil, which is fine–neither do I–but she could have added garlic, basil, and parsley and a more creative dipping sauce than ketchup. I ate two of the rocky potatoes pieces and then stared at my plate wondering how this happened. I bake sweet potato fries with cinnamon only and they taste like candy. I’d go back to the drawing board on this dish. 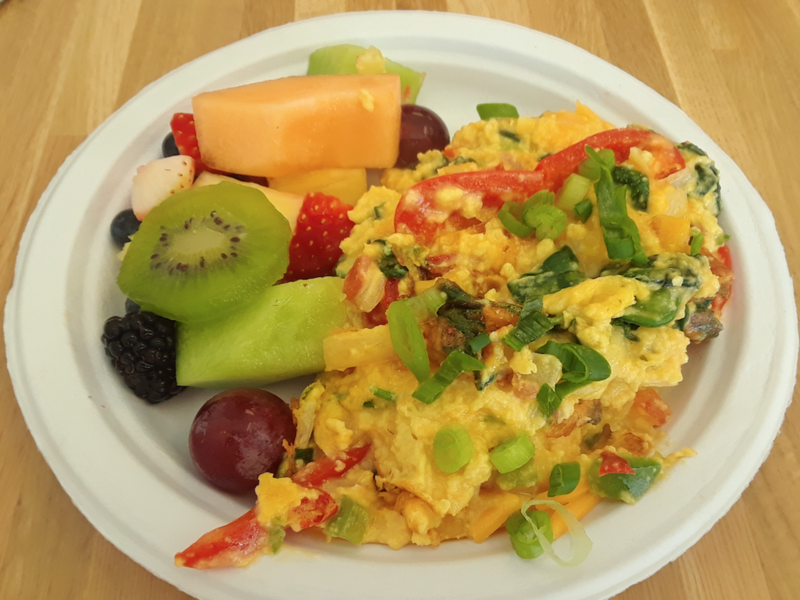 Jade fared much better with the Just Egg Veggie Scramble, which contains spinach, peppers, onions, and tomatoes. It smelled like egg and tasted similar (not the same) but it didn’t quite look like egg. Scrambled eggs usually have large browned wedges of egg that give each bite added texture. That’s what I liked about eggs when I ate them during the Reagan administration. It could pass as egg as it tasted similar and smells like it but didn’t have quite the same texture. For non-finicky diners, they’ll be plenty satisfied. Thumbs up. The price is reasonable for the portion size but this isn’t the Waffle House. Better ingredients still cost more. If you visit, I recommend trying the Just Egg Scramble (not the muffin!) and the Mac & Cheese, Bahn Mi, and the Texas BBQ Burger since Jade sang their praises. She told me the place is busy so I’m sure her menu appeals to customers. I won’t return, primarily because I eat healthier food, but I’ll be rooting for Jade and her team to succeed. After I ate, I approached Jade to learn more about her restaurant. I didn’t disclose my identity. She was eager to talk, genuine, and friendly. She even offered me a free chocolate chip cookie (chewy and delicious), which she makes with Just Egg. Jade has an inspiring story that caused her to start Veg Eats. She’s missing out on a huge opportunity by not advertising it on the website. It would draw visitors.When I asked Jade what she thought about her website, she didn’t express any concerns. That’s a problem as it shows she can’t recognize its shortcomings. As a result, she should hire a web designer to help her rescue it from the 1990s. Jade is passionate about vegan food for ethical reasons. She told me she created “36 versions” of her mac & cheese before she settled on the right recipe. That’s dedication. She stated she made it taste so good that her mother now eats it. Jade was beaming with pride as she told me about the firefighters, policemen, and construction workers who eat at her restaurant. I commend her for figuring out how to make food that appeals to meat-eaters. She also demonstrated she knows how to speak to customers who aren’t plant-based to ensure they feel comfortable trying new options. Jade mentioned that she visits the farms where she buys her vegetables. She stated her suppliers don’t use chemicals, they’re GMO-free, and everything is organic but not all certified. She makes her own cheeses from nuts. Jade stated she pays her staff a living wage so they don’t have to work for tips and uses compostable materials. Although there’s room for improvement, there’s plenty to like about Jade and her restaurant. This ain’t no TGIFriday’s.Jade specializes in comfort food. I avoid comfort food and eat whole foods in their original state so this isn’t a restaurant I’d frequent but it’s what most people eat so I imagine it will continue to thrive. I commend Jade for identifying a problem (not enough vegan restaurants) and taking initiative and having the courage to start her own. I hope she’ll share her story on her website and hang it on the restaurant wall as I believe it would attract people from all walks of life and earn her a committed following. I’ll be rooting for Jade, her team, and the potatoes. Another great review! You give some excellent tips about how today’s businesses need a great website. I usually begin my search for almost everything online. I also like to hear owner stories about why they opened a vegan restaurant. Here is a good example of one: http://leafygreenscafe.com/About_Leafy_Greens.html As far as paper plates go -YUCK!!! I know it is probably easier, but to me it really takes away from a “dining out” experience. The price of $12 is a little high to be served on a paper plate like you are at a picnic. Jade sounds like a great lady whose heart is in the right place & can run a successful business with a little sincere helpful guidance like your review points out. Awesome review. It is nice to know all about a vegan restaurant. Great review. I admire those who are opening and running vegan restaurants. Unfortunately many so far don’t seem to be very good business people. I often see a lot of practices and behaviours going on that would sink a non-vegan restaurant with a non-vegan crowd. Good intentions aren’t going to keep you in business and thriving for the long run. Thank you, Ivy! Well said. Astute observation. Customer service and engagement matter as much as the food. It’s a lesson that’s lost on many small business owners. I hope my reviews serve as a friendly reminder.